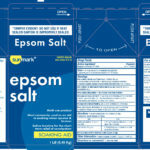 Epsom salt – magnesium sulfate – has many uses in natural healthcare, but my favorite is for soaks – bath soak, finger/hand soak, foot soak, and so on. Note that Epsom salt (magnesium sulfate) is not the same as table or Kosher salt (sodium chloride). What kind of water to use? It is best to use filtered water, to avoid the presence of toxic substances dissolved in the water, that could cause trouble for your skin. a soaking tub, use 2 cups. 2 Tbsp of Epsom salt for every 1 cup hot water. If a finger is infected: ⅓ cup Epsom salt in a shallow cup of hot water (3). For a full bath, soak at least 12 minutes (1, 4); however, I tend to feel so good that I stay in the bath until the water is too cool for comfort. This entry was posted in Uncategorized and tagged epsom, soak. Bookmark the permalink.